Wait. What? I don’t even… Wow. Based on the box art I was expecting a clone of the classic 1989 game “Blockout”. 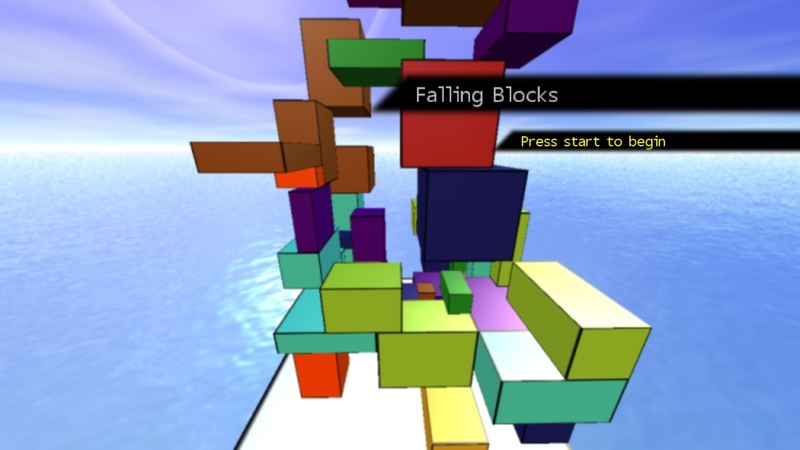 What I instead got out of “Falling Blocks” was a first-person platformer where you are climbing to the top of a pile of blocks as they are randomly generated and fall down onto the pile. You have to dodge and weave (all in first-person, remember), using special abilities to destroy key blocks that are going to be particularly problematic. The game offers you a tonne of power-ups and special abilities, including a double jump that innovatively needs to “cool down” before it can be used again, like a weapon in an FPS that has overheated, and an assortment of warps and other powers. Another unique feature is a warning sound when you’re about to get crushed by a block falling on you from above. Not sure how I missed this since its 2011 release, especially since it’s so different than everything else out there. For 80 Microsoft Points, and absolutely chock full of innovation, this is absolutely worth a download.